A beautiful young girl was walking down the street - when suddenly …Julia Carroll knows that too many stories start that way. A beautiful and intelligent nineteen-year-old college freshman, she should be carefree. But instead she is frightened - because girls are disappearing without a trace. Fellow student Beatrice Oliver and a homeless woman called Mona-No-Name are missing, both gone after being snatched off the street. Julia is determined to discover the reason behind their disappearances - before she's next. Twenty-eight years ago, Charlotte and Samantha Quinn's happy small-town family life was torn apart by a terrifying attack on their family home. It left their mother dead. It left their father - Pikeville's notorious defense attorney - devastated. And it left the family fractured beyond repair, consumed by secrets from that terrible night. Twenty-eight years later, Charlie has followed in her father's footsteps to become a lawyer herself - the ideal good daughter. But when violence comes to Pikeville again - and a shocking tragedy leaves the whole town traumatized - Charlie is plunged into a nightmare. Not only is she the first witness on the scene, but it's a case that unleashes the terrible memories she's spent so long trying to suppress. Because the shocking truth about the crime that destroyed her family nearly 30 years ago won't stay buried forever. 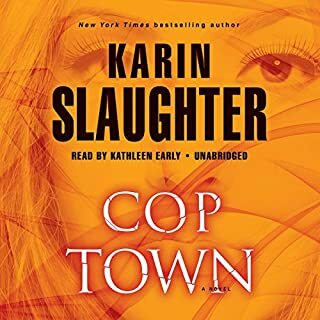 ©2017 Karin Slaughter (P)2017 Blackstone Audio, Inc.
As stated by the other reviewers, you can always count on Karin Slaughter for a good read/listen. Nor will I restate the synopsis of this book as I don't want to spoil it for anyone. I will say I was initially a little disappointed that this was not another book in the Will Trent series BUT I have to admit that this book is far from disappointing. Right from the beginning you get a picture of a family that isn't quite right in their interactions. Following the murder of the wife/mother the surviving members loose their cohesion and it takes another 20 years for them to reunite. This is a really good stand alone book and a great place to get acquainted with this author if you've never heard anything written by Slaughter before. She has such a good style of writing and knows how to pull a reader in. Her characters are very well developed and her storyline complex enough with out getting confusing or predictable. In this book she goes back and forth between the present and the past and wraps up with a solid and complete ending (no cliffhangers). I do hope that if this does become a series that it doesn't mean the end of the Will Trent/Sara Linton series. Kathleen Early does a fantastic job narrating. 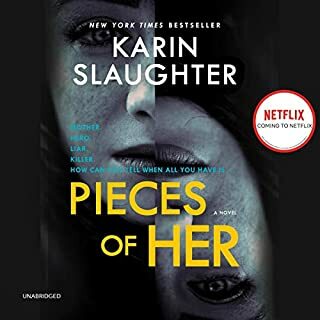 If you're a Karen Slaughter fan you will enjoy this book. If you new to her work, give her a try. She has a talent to create strong, complex, rich characters who capture your heart in spite of their flaws, struggles and personal baggage. While I miss Sara and Trent, two of Slaughter's greatest characters, I loved the sisters in this book, Charlie and Sam, almost as well. The Good Daughter is a long novel with a very well developed plot. Reading or listening to the prequel, The Last Breath, may help introduce the some of the characters and provide background details but is not crucial to understand the plot of The Good Daughter so don't worry if you skip it. I love books that invokes my emotions and Slaughter is a master. I felt it all while listening to this book. I laughed, cried, cringed, empathized, angered,sympathized, and most importantly I could not stop listening! The interactions of her characters are so authentic, at times I could not help but remembering events from my own childhood and relationship with my family, especially with my sister. The quality of the recording is professional. Kathleen Early did a great job narrating. I was impressed how she portrayed each character with passion using inflection, tone, pitch and emotional expression. Together, Slaughter and Early has created a fantastic audible listen! I will not provide the plot summary, the book details and other reviews will do plenty of that. However, if you are sensitive to bad language, beware there are several f-bombs, especially by Charlie's character. It does not feel unnatural to her character nor does it draw back from the book in my opinion but some might find offense. You can always return the book if it's or to your liking. loved the characters and the narrator performance was great! downside - a few very graphic scenes that I had to skip through. 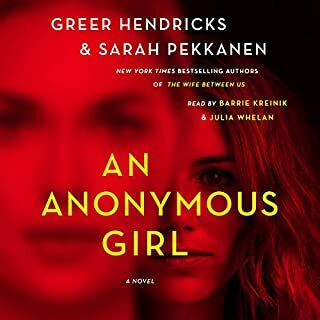 I almost stopped listening to the book because of this, but the sister connection was intriguing and I cared about the outcome of their relationship. I am a fan of Karin Slaughter, but this was just boring. The story about a law case with an excessive amount of details that can only be described as rambling. I have been waiting for this book to end since the first hour in. Extremely disappointed. 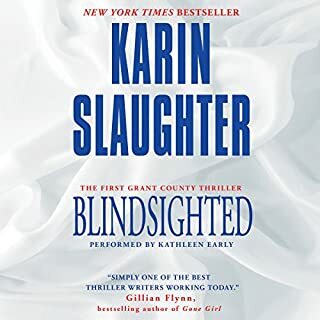 I wish I hadn't read it and ruined the high esteem in which I held Karin Slaughter's books. I like the action to start at the beginning and keep up at a good clip. This was too bogged down in ethical discussions, like two lawyers or psychiatrists discussing issues, and I finally had to give up. Im not interested in a side love story or someone's moral dilemma that goes on for chapters. Give me some action, or I drop out. I have to say i love a book that starts with a HUGE scene! This books is filled with twists and turns and a lot of shocks. I'll admit I feel like these characters were very unique and a little odd at times. The story was a little unbelievable but not in a bad way. I wasn't overly surprised by the twists in the story but it had my attention from the beginning. I think I liked Ben the best of all the characters, he was a good guy from the beginning! I also loved that the sisters found their way back into each others lives. 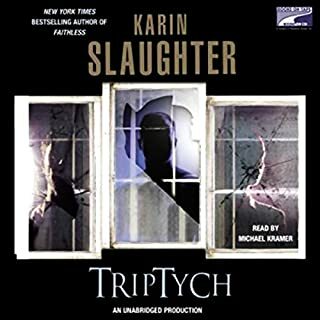 My first Karin Slaughter but probably not my last. The narration was fabulous! She really gave every character their own voice! I'm not quite done with this "novel" yet, I'm not sure I'm going to. It's "painful" to keep listening to, because it keeps going in circles! over the same thing, then just as you think it's gonna move forward, it circles back and rewrites over what had already been said. Frustrating to say the least. this is the second book of this series, the first was short (4) hours and good, this one starts off completely confusing to the listener because it is completely different from the first. the story line is different, the relationships are different, and it's depressing, I almost thought I was out of sequence because it didn't make sense to me. it is the second in the sequence, but that's not much help. nothing I dislike more in a book, is when there is a time you think you're gonna get some information to make things come together, and it drops off the side of the earth! just frustrating to me, the narrator is good, it's about the only reason I'm still listening, maybe I want to see if this story is ever gonna come together and finally make sense! Done with the book, It's long, and I won't listen to it again. Don't expect an ending in this book. Boo. Great story, however, I felt it was slow, taking too long and drawn out to get to the point. I am extremely dissatisfied I would have to buy another book to get to the end. Boo. 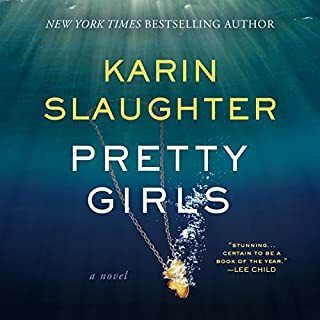 Karin Slaughter has written so many outstanding novels that picking the best is impossible for me. My current favorite is probably The Kept Woman or maybe Beyond Reach or Triptych or even Pretty Girls. The Good Daughter is not as good as any of those, but it is still a solid 5 star suspense mystery that I highly recommend. As usual Slaughter shines most with her great talent developing characters. Slaughter is one of my favorite authors. 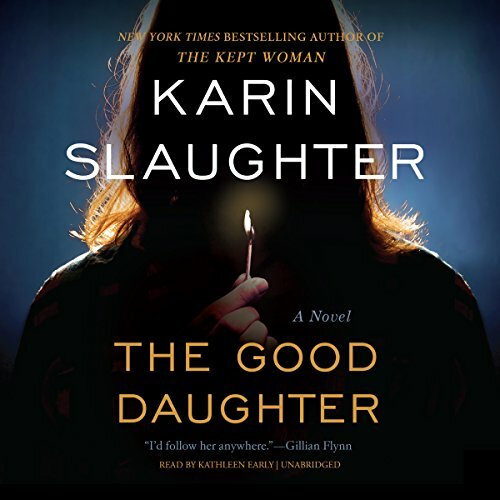 Audible shows The Good Daughter as Book 1 in The Good Daughter series. There is certainly potential with sisters Charlie and Sam for future novels, but I doubt it will happen. The sisters could, I suppose join together in Atlanta, possibly with Charlie's husband, in a criminal law firm We shall see. Whatever direction she takes her career, If she writes it I will read or listen to it. Charlie's older sister Sam (Samantha) had a much larger role in this novel that I anticipated after reading the prequel (Last Breath). Kathleen Early's narration is outstanding. Aboslutely. Slaughter creates a gripping mystery from the first chapter in this book.There is a deadly school shooting, but she created multiple suspects with really clever writing. And I found myself entranced with the characters, so much so I cared more about their family drama than I did about the mystery itself. Make no mistake, the mystery is excellent. Charlie, the impulsive younger sister. She is smart, feisty and funny as hell. The hospital scene where the family patriarch, having been stabbed, is reunited with his eldest daughter after years of estrangement. Its really the first time we meet him face to face, yet it reveals so much of his influence in the lives of his daughters. And its really wiity. Yes indeed, its all I could think about while listening. Kathleen Early is the best narrator possible for this and really all of Slaughtee's works. Her accents, timing and tone is spot on. I suspect Karin Slaughter would say Early makes her best work better.